Oh the weather outside is frightful, but the chess is quite delightful. Yes friends it’s snowing so what better to do with my day than play some chess and get a few games posted. First up we have a game featuring the French Defense. I do not like playing against the French. White I’ve done fairly good against it, I can never seem to get the types of positions I would truly like to play. Having played a large number of White attempts to overrun the sturdy 1…e6 (including the Winawer, Tarrasch, and various gambits) I have recently set my sights on the Exchange Variation. While the Exchange Variation has a history of being draw-ish, it was recommended by IM John Watson in some video lessons on ICC. I figure if a French expert like Watson recommends it, it definitely deserves a closer look and he certainly provides enough compelling evidence that I am paying close attention. It seems counter-intuitive that White should ease Black’s game by exchanging pawns in the center. However, White isn’t looking to beat Black out of the opening. It’s impossible. The French is a valid and very sound defense. 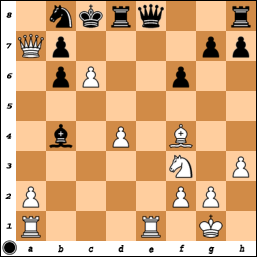 Instead White is looking simply to get his pieces developed quickly and then look to outplay Black in the middlegame. Basically a lot of Black’s theory is out the window at this point and White’s game is pretty easy to play. 4.c4 is Watson’s recommendation and I’ll be playing that in the future, but for now I’ve been sticking to this more common, though less trick continuation. This is the recommended set-up for Black and he’s certainly not worse here. As the game goes though you’ll see that Black still needs to be on the lookout. 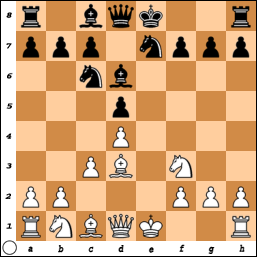 A) 10.c4 Bxd3 11.Qxd3 and I like White’s chances with the isolated pawn the most. B) 10.Bxf5 Qxf5 11.Qb3 0-0-0 things are equal, but I don’t see a very active plan for White. C) 10.Bf1 could be playable too, though it isn’t exactly in line with White’s idea of quick development, for example: 10…0-0 11.Nh4 Be6 12.Nd2 Rae8 13.Ndf3 Nf5 and it’s Black’s pieces that are more active. 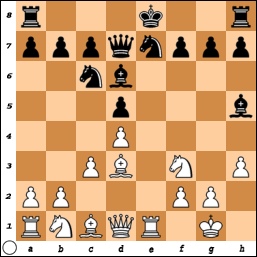 White gains space on the queenside with ideas of a pawn storm on the Black king. The bishop may prove useful in supporting the queenside attack so I chose to retreat it rather than trading. After 12.Bxg6 Black can play either 12…Nxg6 with ideas of occupying f4 or 12…hxg6 with play for the rooks down the h file. 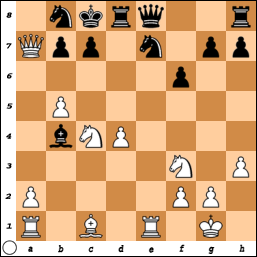 Generally a good move, it keeps White from occupying e5 with the knight. 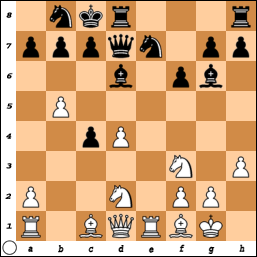 However it allows White to get things rolling on the queenside. The computer calmly recommends 12…Rde8 and now if 13.b5 Nd8 offers Black better defensive resources. 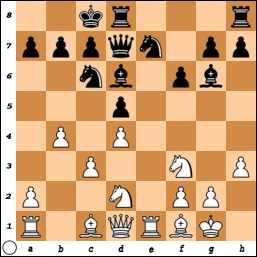 Better may have been 14…b6 when White would have to work a little harder to break things open. 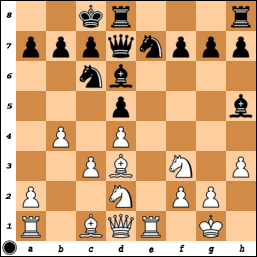 Other moves allow White to play 15.c5 and the pawns will pry open the cover in front of the Black king. 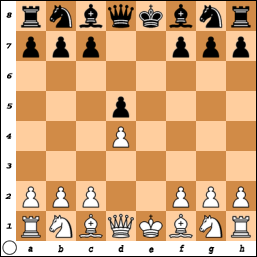 15…Bf5 is recommended by the computer, but White still gets a good attack with 16.Qa4. Something about a piece sacrifice that makes it more appealing. Better is 20…Qxb5 but even then 21.Qxb8+ Kd7 22.Qc7+ Ke8 23.Rab1 Qc6 24.Rxb4 Qxc7 25.Bxc7 Rd7 26.Bxb6 is losing for Black. So to summarize, despite the drawish reputation of the Exchange Variation it presents Black with several problems that can be difficult to solve. White can get good development and an easy game without having to memorize a lot of theory. As always feel free to comment, ask questions, or critique something. Another nice article, Daniel. Thanks!